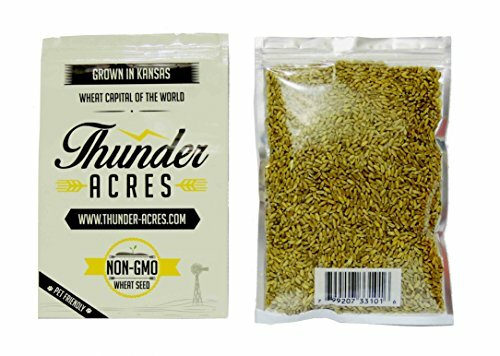 Thunder Acres seed is guaranteed to be the freshest on the market. How do we know this? We are the ones who planted the seed, grew the seed, harvested the seed, cleaned the seed, and stored the seed. You are buying directly from the source. There is no middle man or unscrupulous seed dealers who make claims with out knowing how the seeds were actually grown. We grew the the seed on our farm in Kansas. This Wheat seed is Non-GMO and chemical free. Can be grown for cat grass or wheatgrass. Wheatgrass juice is high in vitamins and minerals. Promotes a healthy immune system for your pets. Our pet love it and so will your. Shipped in a resealable bag to help keep the wheat seed fresh to the last berry. We strive to grow the highest quality wheat seed on the market. It is our promise to deliver a premium product to you and your pets. Grow Amazing Cat Grass or Wheatgrass - only difference is in who eats it! Buy directly from the source with no middle man. If you have any questions about this product by Thunder Acres, contact us by completing and submitting the form below. If you are looking for a specif part number, please include it with your message. Scotts Complete 4 Step Lawn Program - 5,000 Sq. Ft.